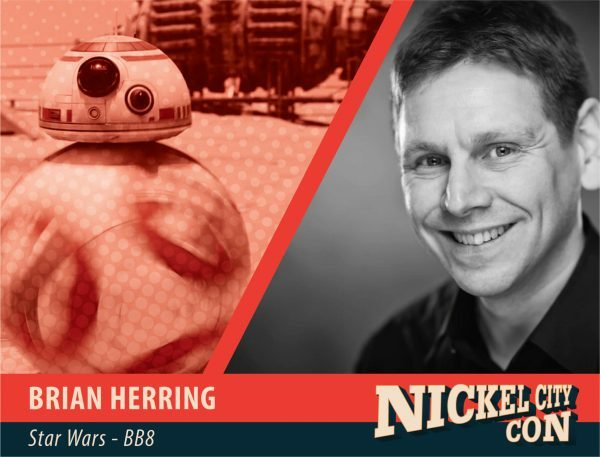 Brian Herring is best known for his puppeteer performance as BB-8 in Star Wars: The Force Awakens & The Last Jedi, and the forthcoming Star Wars Episode IX , SE-2 in Rogue One, and The Last Jedi’s adorable Porgs, Brian also puppeteered various droids and creatures throughout the most recent Star Wars trilogy including Ponda Babba, Bor Gullet, First Order Mouse Droids, Steel Pecker bird, many animatronic creature heads and actually appearing as a Ball-Fight Gamer in Maz’s castle and a Resistance Soldier in the battle of Crait. He played the Parrott-faced Hirang Birren as well being part of the core puppetry team responsible for bringing Lady Proxima, Rio Durant and many other characters to life in Solo. In addition to performing these memorable roles, Brian was initially hired as Puppeteer Consultant, working with the CFX Dept to develop many of the creatures from page to screen. He was also responsible for finding most of the performers that brought the all of the unique creatures in the current Star Wars universe to life. Brian began his career in 1989 after growing up in and around theatre, he joined the UK’s premier satire show ‘Spitting Image’ (1992) as an assistant puppeteer where he worked with Phil Eason (Yaddel) and Tim Rose (Admiral Akbar). In 1999 he joined the world famous Jim Henson company and was a principal performer on all of their UK TV productions until they closed their English production arm in 2005, working on such productions as Mopatop’s Shop (Father Mouse and many guest characters), Construction Site (Diggs) and The Hoobs (Hubba Hubba and Groove). His other children’s TV work includes; Wizadora (Hangle), The Animal Magic Show (Billy Nibbles), What’s Your News? (Anthony, Peek and Gi Ant) Space Pirates (Stringy) and Wizards Vs Aliens (Stickley & Squiggly). With the arrival of computer animation and CGI, using digital motion-capture systems, Brian has worked extensively in many aspects of puppetry and suit performance on both stage and screen to develop new types of virtual puppetry and keep performers at the heart of performing. His work includes; various frogs, pigs and chickens in ‘Muppet Treasure Island’ (1996), Vogon minions and the Ravenous Bugblatter Beast of Traal in ‘The Hitchhiker’s Guide to the Galaxy’ (2005), Infected in ’28 Weeks Later’ (2007), Silkard the fish vendor in ‘Hellboy II The Golden Army’ (2008), Hammerpede in ‘Prometheus’ (2012), The London 2012 Olympic Opening Ceremony, Ice Warrior in ‘Doctor Who’ (2013) and Gordon in ‘Victor Frankenstein’ (2015). In the world of popular music he had been involved in performances with Scissor Sisters, Olly Murrs, Metallica and Ed Sheeran.